During our five nights in Budapest, the Hungarian capital truly lived up to its nickname as the Pearl of the Danube. A city of two parts, Buda and Pest, we spent every waking moment exploring both halves of this culturally rich and magnificent city. 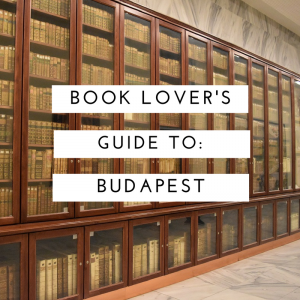 Straddling the Danube and representing countless centuries of history, it comes as no surprise that Budapest contained incredible choice and variety for all booklovers who choose to visit. 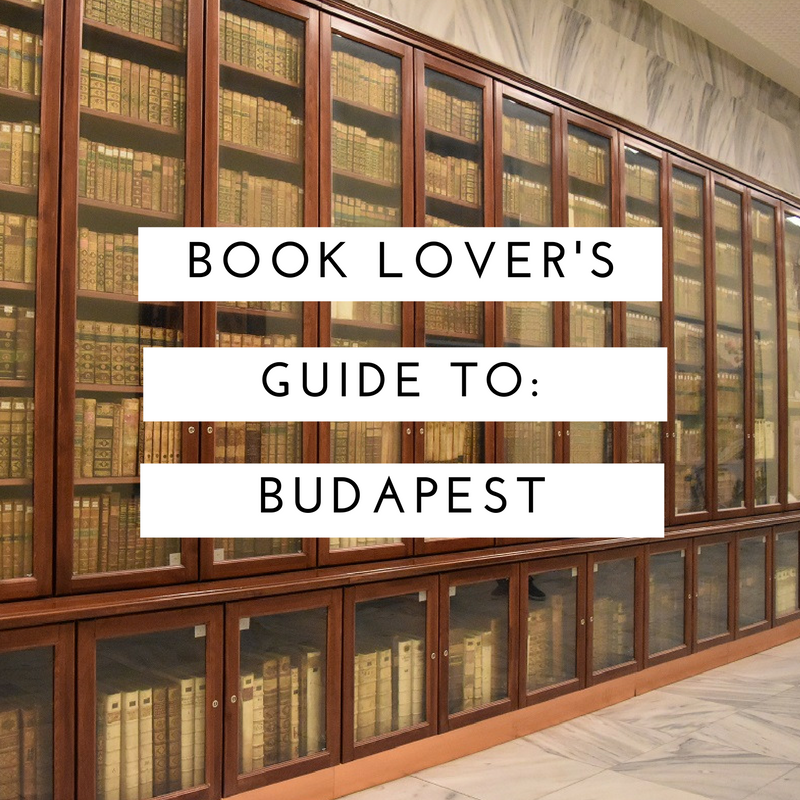 Be warned, a bumper ‘Book Lover’s Guide to’ post is coming, but even with all these words, and all these locations, we could only capture the briefest glimpse of the literary delights Budapest had on offer. Modern, spacious and bright. Alexandra contained a good variety of English books, as well as German and French across a respectable range of genres. In addition, this store had two shelves dedicated to translated works by Hungarian authors, so if you’re looking to read something local, don’t skip this one. X-Factor: Ascend the escalator and enjoy lunch at a hidden restaurant under an incredible painted ceiling. Without a doubt our favourite bookish destination of Budapest, this second-hand bookstore and café combo is utterly unmissable for anyone wanting to enjoy a chai latte while tucking in to a good book. Located on a rather unassuming street, we visited Massolit twice during our short time in this city, and both times we found a book off the shelves to lose ourselves in. Homemade cakes, good coffee and range of tea, incredible range of English books and not to mention the free wi-fi makes this the go-to destination for the American or British diaspora living in or near Budapest. X-Factor: You mean, apart from the fact that it’s a wholly-English bookstore with loads of charm in the middle of Budapest? Well, you can also spend some time perusing the tiny art gallery showcasing works from local artists if you tire of reading. Similar to the Alexandra we visited and reviewed above, this store contained three whole levels of books. Its English range was slightly smaller and reserved mostly for classics and general bestsellers, but if you’re after a bookish oasis after exploring the sights, it’s worth a quick visit. X-Factor: This store boasts a huge range of notebooks and stationery items. For this entry it’s worth reviewing the street as a whole, rather than every individual store we visited (because there were simply way too many). Dozens of Antiquarian and second-hand books line this street, some tucked away behind scaffolding, others boldly facing the road, every single one worth a visit. Situated across from the National Museum, you can always visit a few that catch your eye after soaking in some Hungarian history across the road. Below are three bookstores on this street that really stood out to us when we visited. Boasting an impressive collection of antique maps and books, as well as small selection of second-hand English classics, this store was neatly laid out and made maximum use of its available space. Almost a hybrid between book museum and bookstore, this Antikvarium also contained a great number of tomes that you could view. X-Factor: The collection of very old bibles enclosed in glass cabinets and available to browse. Much smaller and cosier than the store above, Europa is a two-room bookstore with tall shelves and haphazard displays. Here you’ll find three shelves dedicated to English books, and of those most are classics from the first half of the 20th century. X-Factor: English range of books are comprised mostly of the popular orange Penguin classics. Probably the smallest of stores we visited on this street, this second-hand bookstore is absolutely crammed with paperbacks and hardbacks across every square inch of surface. Books piled high, books stacked three deep on shelves, books threatening to topple and drown you as you pick out a novel that catches your eye, this place is less like a store, and more like some great literary jungle. X-Factor: While we didn’t spot any English books here, channel your inner explorer and go hunting through the bookish jungle in search for one! Just a short walk from the Antiquarian street in a small square opposite a garden is the quaintest little book cart we’ve seen. While we didn’t spot any English books, as it mainly stocks second-hand all you’ll need to do is ask! X-Factor: It’s a street cart and an adorable photo opportunity! Inside an old palace resides a modern city library, filled with shelves and reading areas and oozing Communist-style utilitarian charm. Up a couple of floors, however, is a hidden series of beautifully-restored reading rooms built in the style of the original era. There is a 500HUF entry fee per person, however in our opinion it was worth it to view this wonderful building. X-Factor: The old smoking room is the only one with bookshelves stacked with books, and also contains the added bonus of a spiral staircase, which unfortunately you cannot climb up. A gorgeous bookstore with mezzanine balcony, you’ll find many niche books with a ‘hipster’ vibe, modern classics alongside cult classics and as an added bonus, they’re all in nice paperback editions – no movie tie-in covers here! X-Factor: A large range of English coffee table books covering topics such as movies, music, art and architecture. This Art Deco icon on the main thoroughfare is located opposite the opera, and is utterly impossible to miss on the corner with its distinctive Art Deco sign. Inside is just as striking as the exterior, complete with book ladders and ceiling-high bookshelves. Regularly the host of book launches and author talks, there was one in progress when we visited, which unfortunately prevented us from exploring the first floor which contained their range of English books. X-Factor: Great atmosphere enhanced by bookshelf ladders! Most visitors to the old town of Budapest are likely to walk right past the library on their way to the palace museums. Temporary exhibitions alongside permanent ones tell the story of the library, from its origins to its current iteration. Note there is a 500HUF entry fee per person, which we believe is worth it for the exhibits, but you could probably give the rest of the admittedly stark and modern upper floors a miss. X-Factor: Glass bookcases containing old and original tomes from the founding of the library. International bookstore a stone’s throw away from the famous – and must see – basilica. Specialising in books in at least five different languages other than Hungarian, you can be sure to find something to read in English, German, Italian, French or Russian. The English section is the largest and most diverse, ranging from classics and crime to sci-fi and fantasy, alongside popular new releases. X-Factor: Best selection of English YA we’ve seen in Hungary. Phew! What an article! If you’ve stuck with us up until now, we thank you. Budapest was a blast and we’ve added it to our ever-growing list of Places We Want to Visit Again. But until then we must say farewell, and board our overnight sleeper train to Brasov, in Transylvanian Romania! I’ll definitely be checking out ‘Massolit’ and maybe ‘Book Island’. Thanks again, I am so lucky to find your blog I really wanted to find some hidden hipster book store and cafe, getting both in one is even more fortunate!